Gone are the days of Raw Hide Bones, Veterinarians no longer recommend them. So what do you give your teething puppies and dogs to play with now-a-days you ask? Here are a few of my favorite things!! I consider all of these "Must Haves"! All of my puppies and dogs have had these, so these are tried and true! Highly recommended from my furry family members to yours!!! Every dog should have these! I have not listed anything that I personally haven't bought and given my dogs. In fact these are all staples in my home! When they have become worn, I have re-purchased each one...that is how much I love and approve of them!!! Puppy Kong - upgrade to a red Kong as puppy grows up (older, more aggressive chewers should upgrade to a black one). 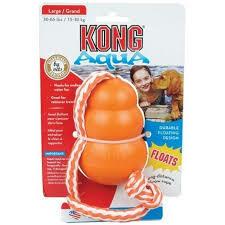 Also for fun in the sun there is the Aqua Kong! It Floats!! These are all proudly Made in the USA! Nylabones - Start with a puppy bone, then upgrade to larger sizes as puppy grows, and get durabones for aggressive chewers! These are all proudly Made in the USA! Puppy Kong Tennis Balls! Dogs Love the Squeaker inside & both these types below are a hit with my Dogs & my Puppies!! These are Designed & Tested in the USA, but sadly not made in the USA! Feel free to drop Kong a line with a message that you are disappointed that these particular two toys aren't made in the USA & that they should make them here in the USA! In this day and age, we all are becoming aware of how important it is to purchase only safe toys for our dogs! We are becoming educated about the materials that these toy companies are using to make the toys our dogs are playing with, and that some companies are making inferior products with unsafe materials that can hurt or even possibly kill our loved ones! Therefore, I do feel very strongly about the importance of buying toys made here in America! I practice what I preach, and every toy listed here you can find in my home (or outside!). I know it's easy to look at a toy and think it's cute and think you must pick it up for your dog, but I challenge you to look and think deeper, do you know it's been made with safe materials? Do you want to take a chance with your furry family member? We have to treat picking out toys for our dogs, like we would our children, we need to research the toys, we don't want to buy toys made in a country that may use unsafe lead paint on them, that might use unsafe materials that can harm or kill our dogs. If you find a toy that you cannot live without, and love, but that isn't made here in America, I challenge you to take a stand, write to the company and ask them to make the product here in America, that your dogs safety is important! That America can use the jobs it would create! If you write, if enough pet owners unite and demand safer toys and better standards for our pets, the companies will get the message!! If you are currently waiting to bring home a puppy from me and would like some of these puppy essentials, just send me a message using the contact me form, email me, call me, or soon you can goto my store on here and place an order. I can have everything for your puppy, here and ready for you to bring home. If you would like I can also arrange everything in a crate package for your children or loved ones to surprise them! We offer a crate package, feel free to inquire about it, and this way you will have everything you need on the big day!! By letting me know ahead of time, what item or items you would like, it allows me time to pick it up for you, and it will save you money by avoiding shipping charges. Click on the button above to read more about KONG toys and get some tasty recipes your dog will LOVE! Please Note: I do not get paid to recommend any of these products from any of the companies mentioned to you. I am not employed by them, nor do I have relatives that work for them. They have not influenced my decision at all nor have they asked me to include their products on my website. I am only listing these products because I'm asked all the time to recommend safe toys for puppies & dogs, and therefore decided to put it on here for everyone who needs some advice on what to purchase for their furry family members! These are all toys I buy and have in my home for my dogs, and that I feel are safest, and made well. I will update this list from time to time, and if ever you have a question about a particular toy for your pet, feel free to ask me, if I know the answer I will share all I know with you.